The Messiah figure (or Christ) in the Book of Enoch, specifically in the Parables or Similitudes section of that book, has several attributes and performs certain functions that make him a precursor of the Christ figure who became the focus of Christianity. Paul’s understanding of who and what Christ was appears to have been influenced by the Book of Parables in 1 Enoch. Paul says that his gospel was revealed to him so it is easy to assume that either God revealed Christ to him in a vision or that he developed his own Christ concept to preach. However, the similarities of his Christ with the Christ/Messiah in Enoch are striking. Moreover, the same Enochic literature teaches that Christ is a figure unknown except to those to whom he is revealed from heaven. Or was he revealed to Paul, at least in part, through the Book of Enoch? 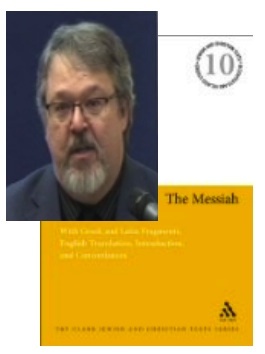 This account of at least one Jewish group’s beliefs about the Messiah before the time of Paul (and Jesus) is taken from The Messiah: A Comparative Study of the Enochic Son of Man and the Pauline Kyrios by James A. Waddell. The previous post in this series is here. We shall see through this series that this Christ, the Anointed One, is also named the Righteous One, the Chosen One, the Son of Man, and Name of the Lord of Spirits. We begin to look at some of the attributes or nature of this being in this post, and then we will (courtesy of Waddell) study the functions, the role, of this Messiah. The second vision which he saw, the vision of wisdom — which Enoch the son of Jared, the son of Mahalalel, the son of Cainan, the son of Enos, the son of Seth, the son of Adam, saw. the garden where the elect and righteous dwell, where my grandfather was taken up, the seventh from Adam, the first man whom the Lord of Spirits created. So Enoch, we are emphatically assured, belongs to the human race. He is a descendant of Adam. The Christ we read about in the letters of the Apostle Paul has many striking similarities to another Christ we read about in the earlier Second Temple Jewish Book of the Parables of Enoch. So much so that James A. Waddell, Philip Markowicz Visiting Professor of Jewish Biblical Studies at the University of Toledo, argues in The Messiah: A Comparative Study of the Enochic Son of Man and the Pauline Kyrios that Paul belonged to that stream of Jewish intellectual tradition that developed its concept of Christ, the Messiah, out of the messiah traditions we read about in the Book of Enoch. Waddell’s book was published in 2010 and his claim about the scholarly consensus is supported by reference to half a dozen articles in Boccaccini’s Enoch and the Messiah Son of Man (2008) among a list of earlier publications. To me, and I am sure to many others, questions of dating are important. So this post attempts primarily to explain Waddell’s rationale (presumably shared by many of his peers) for dating the BP to a pre-Christian era. The next post will begin to examine the nature of the Christ/Messiah as understood before Paul among the Jews associated with this document. Other readers may wonder about the stress upon the “Son of Man” in both the above titles given that (1) Paul never uses the “Son of Man” in relation to Christ, and (2) Emeritus Professor Maurice Casey is reputed to have written “the definitive” work on the Son of Man and supposedly buries any notion that “son of man” was employed as a messianic title up to and including the time of Jesus. As for (1), Waddell’s thesis includes a cogent theological explanation why Paul would have shunned the term in relation to his Christ; as for (2), Waddell exposes inconsistencies in Casey’s treatment of the evidence and generally leaves Casey’s approach to the question looking tendentious indeed. Another contemporary Emeritus Professor addressed by Waddell is Larry Hurtado. Waddell agrees with Hurtado’s case that the evidence argues that the Christ Jesus was worshiped “from the moment of the Easter experience” (jargon designed to harmonize the Gospel-Acts narrative with modern rationalist sensibilities) for the beginning of Christianity, but rejects Hurtado’s complementary claim that the worship of any other figure apart from God himself was unknown among Jews before Christianity. Waddell argues that evidence contradicting a scholar’s personal faith has been treated tendentiously. The BP do indeed depict early Jewish worship of a being alongside God. I’m taking notes from Strelan’s article without much modification and only little of my own comment. Readers can decide for themselves the strength of his case, how suggestive it might be . . . .
Rick Strelan sees the author of the Gospel of Mark, like the authors of the pseudepigraphic and Qumran writings, being most conscious of his time being the time of a faithless generation (Mark 9:19). The Gospel begins with a call to repentance, and follows with Jesus battling against and overcoming the powers that ruled and oppressed that generation. These powers of evil were demons, and according to the Enochian legend of the Watchers, were the offspring of fallen angels and human women (Mark 3:22-27). Like the Enochian Son of Man in Enoch, Jesus gathers angel-disciples around him and gives them authority to cast out demons and unclean spirits (3:15; 6:7). But they can only execute that authority if they are faithful (9:14-29). The gospel is about faithless generation in a time of testing. The disciples (and Mark’s Christian audience) are tested by persecutions, cares of the world and the desire for riches (4:14-19). Jesus’ followers are commanded to Watch. 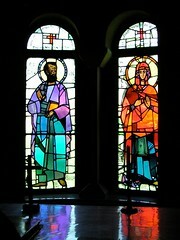 Peter, Andrew, James and John are the first and only disciples explicitly called to “come behind” (οπισω) Jesus. Hence they are the leaders of the band appointed to be with Jesus. Strelan cites H. Seesemann in TDNT, V, pp. 289-92 to explain that this preposition, οπισω, is used in the Septuagint to express the relation between God and his chosen people, and implies full commitment and service to God.